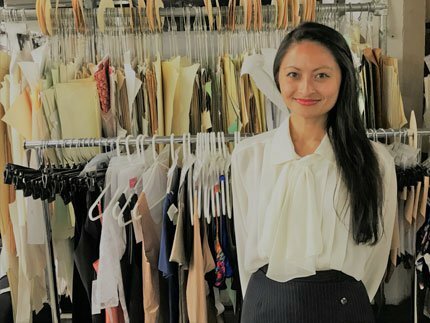 Since 1976, Fashions Unlimited has crafted garments for brands such as Hanes, Adidas, and Liz Claiborne all while weathering the storms of economic recession and outsourcing that have claimed many of their local competitors. 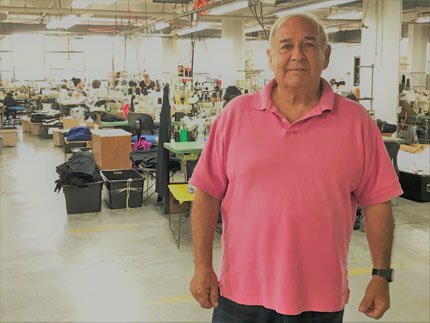 Voted by Apparel Magazine as one of the Top Innovative Companies in the Industry for 2018, the Baltimore City manufacturer nestled in the historic Pigtown neighborhood has established itself as a leader in high-end performance apparel manufacturing. Phil Spector, owner and founder of Fashions Unlimited, came to Baltimore for a job at the Pilot Blouse company. After nine years of working in the industry, Spector saw garment factories in the city closing shop due to increased competition overseas. With just two sewing machines and five workers, Spector opened Fashions Unlimited and laid down permanent roots in a business that was seemingly being uprooted in the U.S.
Over the years, the company has had three locations starting on Eutaw Street, then Mount Street, and now on Wicomico. But they’ve kept up with their competitors all while managing to still use traditional machines to construct some of the most innovative products on the garment market. Spector says, it’s not the machines, but the techniques and expertise, that make the garment. When faced with the challenge of having a high-demand for work but a lack of people skilled in apparel manufacturing, Spector once again turned to an “in-house” approach to solve the problem. This year the company’s Head of Innovation, Stacy Stube, established a Fashion Innovation Hub geared towards educating people on the niche target market of the industry and how to become profitable. Much of the demand that Fashions Unlimited is experiencing is due to start-up entrepreneurs – that don’t have a fashion background – but find a need in the marketplace that the garment industry can solve, such as high-tech performance gear for athletes. For example, an innovator can create a fabric that repels liquids, but they need a place to turn that fabric into a wearable product. That’s where Fashions Unlimited comes in. “Baltimore has acted as an innovation-rich hub, with key partners such as Harbor Designs, that work to integrate the technology into the garments that are making smart fashion,” said Spector. Fashions Unlimited’s client roster includes names such as Oscar de la Renta, Coach, Rag N Bone, Champion, Hanesbrands, Liz Claiborne, J. Crew, Adidas, and more. For more information, visit www.fashions-unlimited.com. We're celebrating manufacturing in Maryland all month long. Read even more stories from our state's manufacturing industry here.